ABOVE: A tiny wedding chapel (left) faces the main entrance of the Restaurant-Hotel Schloss Wilkinghege. Schloss Wilkinghege is a moated castle that was first documented in 1311 A.D., when it belonged to the von Rhemen zu Barensfeld family. The current building dates to 1550, when the castle was rebuilt by the Steveninck zu Broich family, whose stone crest remains above the entrance. The hotel has 35 rooms with 60 beds. Castle rooms have a traditional decor, and the annex--formerly the stables--offers modern rooms. A turret opposite the annex contains a two-story Maisonette Suite, while a luxury suite within the castle has a large bathroom with a whirlpool. The castle's Vitrinen-Reiterzimmer restaurant seats 30 guests in elegant surroundings, and a buffet breakfast is served in the vaulted 15th Century cellar. A castle for couples: The Schloss Wilkinghege chapel is available for weddings or renewals of vows, with receptions in the castle park and dinner in the Rittersaal ballroom. Book well ahead, because the chapel is popular with local couples and graduates from the University of Münster. 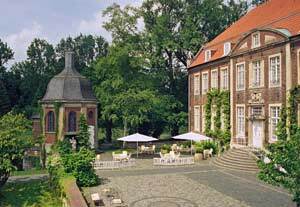 For more information, including rates, visit www.schloss-wilkinghege.de.